Yano Research Institute (the President, Takashi Mizukoshi) has conducted a survey on the domestic credit card market and has found out the current status, the trend of the market players, and the future perspectives. The Japanese government has set forth a policy to promote a cashless society at several opportunities, including Japan Revitalization Strategy by Ministry of Economy, Trade and Industry. In response to increasing number of foreign tourists as well as various international events scheduled to take place throughout Japan until 2025, the government has set the goal of increasing the domestic cashless ratio to twice as larger by 2027. The government also has another goal of increasing the number of foreign visitors to 40 million by 2020, which requires convenient payment infrastructure for such foreign tourists. The attempt to build such payment infrastructure has started ever since Tokyo has been selected for the host of the Olympic and Paralympic Games 2020, in order to facilitate the credit card payment by the foreigners without any stress just like they do so at their home countries. 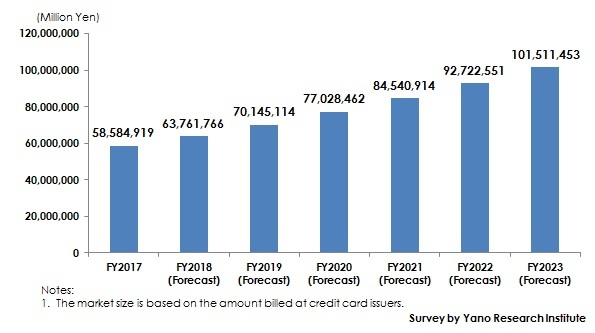 The credit card market size, based on the amount billed at credit card issuers, expanded to around 58 trillion yen by FY2017. The market expansion has caused by expanded opportunities for the users to use their credit cards, as the leading credit card issuers pressed ahead with packaged campaigns to encourage new membership, offered some point reward campaigns for the existing cardholders to let them increase their points according to the amount and frequency of use of the credit cards, and gave incentives to the member stores. The credit card payment is categorized into the following three types according to authentication method: 1) Contact payment using conventional card reader; 2) Contactless payment using NFC (near field communication); 3) Payment using application including QR code payment. Note that QR code payment is the payment that uses credit card connecting with applications. The amount dealt by contactless payment in Japan has rapidly grown recently. Among them, those using smartphones (mobile contactless payment) have especially grown. Due to increasing awareness of iD and QUICPay, the stores that enable smartphone payment have been rapidly increasing. In addition, with Apple Pay entered the Japanese market, most of the contactless payment is likely to be occupied by smartphone payment by FY2023. The credit card market is expected to be on the rise, because wider acceptance and expanding use of QR code payment, in addition to smartphone payment, are likely to increase the users of credit cards. Users of QR codes are expected to increase, as they are likely to be widely adopted at small and midsize companies, although they had hardly accepted credit card payment. It is because QR codes enable them to connect with the marketing measures aiming to keep and acquire the customers who use in-house electronic money issued by such companies’. What is the credit card market? The credit card market in this research is the market of transactions via credit cards by the domestic credit card users who shopped at in and out of the online shops as well as the real shops. The market size is based on the amount billed at credit card issuers for the purchase using the credit cards.